There is no denying that if you want a can opened with minimal fuss, an electric can opener is a way to go. Of course, it is only once you actually start your search that you realize just how many brands and models you have to choose from. While this may seem like a good thing, you might actually just end up being more confused than you were at the beginning of your quest. So, to help you sort through the clutter, we decided to do our own research. We found electric can openers that were easy to use, offered smooth cuts, and worked well with most kinds of cans. Now, all you have to do is skim the reviews and decide which one sounds like the best electric can opener for you. There really is a lot to like about this can opener. For starters, this device is equipped with a side-cutting system. The main benefit of this is that you can be quite certain that there will no jagged edges – instead, you will be left with a smooth, safe opening. The other advantage of this feature is that it makes it much easier to seal off the cans again if there are leftovers in them. The other thing to like about this particular model is that it works well with different kinds of cans. It can open most standard-sized cans and works with both regular tops and pop-tops as well. Then there is the fact that it is incredibly easy to use as a can opener as well. Not only does it boast an ergonomic design, it also has a sensitive, easy-touch opening lever that works with the slightest touch. This is also a rather compact appliance which hardly takes up any place on your countertop. Now, while there is no denying that this can opener is good, it does have its flaws. The most notable is that there is no auto-shutoff function which means that you have to manually stop the machine once it has completed one rotation. If you fail to do this, the opener will continue to work, shaving off thin metal strips that can fall into your food. If you are looking for a can opener that is affordable and works well with most kinds of cans, then this is definitely the opener for you. You will find that it is incredibly easy to use. For one thing, it has a Power Pierce cutting blade that easily cuts through all cans, leaving behind a smooth edge. To top it off, the can opener is equipped with a magnetic lid holder that ensures the lid won’t fall into your food once the blade has finished cutting through the can. This can opener is incredibly simple to use and doesn’t require much effort on your part. You just have to hold the can in place. Thanks to the automatic shut-off function, when the entire lid has been cut through, the machine will stop on its own accord. It is just unfortunate that this can opener will struggle with certain cans, especially if they have wide circumferences. Also, since the housing isn’t made from the greatest materials, it is unclear just how long this opener will last, especially if you use it quite often. The compact does fit on your countertop well, though, and doesn’t take up much space at all. If you don’t want any more appliances crowding up your countertop, then this is the can opener for you. 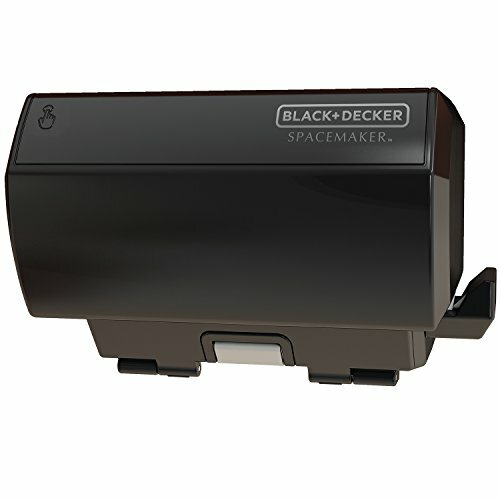 The Spacemaker is an under-the-cabinet can opener which is both an advantage and disadvantage. The benefit is that you get to save on a considerable amount of space. Also, you can open taller cans as you don’t have to stick with any height recommendations as the opener is positioned above the counter. However, this also means that you have to make an additional effort to actually install the opener, which isn’t the easiest project to undertake. In addition to being a can opener, this appliance can also function as a bag opener, bottle opener, and knife sharpener. Moving on to the actual performance of the can opener, there really aren’t any complaints here. See, the opener is equipped with a Power Piercer system which allows you to easily cut through the tops of cans. This can opener has an automatic shut-off function that ensures that the machine stops once the entire lid has been cut off. The only other downside is that this isn’t the sturdiest of can openers and so, it can be difficult to determine just how long it will last. There is no denying that this is one of the easiest can openers you can use. This is largely because it relies on a single-touch operation and doesn’t have a learning curve. What’s more, the can opener also has a magnetic lid holder and a stable base which prevents the cans from slipping around while the opener is working. All of this, combined with the fact that the machine has a power cut blade that easily cuts through cans of all sizes means that it is a good value for money. It also has a removable activation lever that makes this can opener easy to clean. The appliance is quite compact and barely takes up any space on the counter at all. Unfortunately, it doesn’t have an automatic shut-off function so you do have to keep an eye on it and stop it yourself. There is also the fact that the opener is made from rather flimsy materials. So, if you are opening a heavier can, you do need to stabilize the machine first so that it doesn’t fall over. This also brings into question just how long the can opener will last in the long run. Top-cut openers: here, the blade cuts into the top of can’s lid, leaving the sides of the can untouched. The benefit of these openers is they are incredibly safe and you won’t cut your hand on the edges. The downside is that the blade can make contact with the food, meaning that you will need to keep cleaning it. Side-cut openers: side-cut openers, on the other hand, cut into the side of the can, at the very top of the container. The good news is that with this opener, the blade never touches the food, meaning that you don’t have to clean it as often. Typically, this type of opener also tends to produce smoother edges. At the same time, it can be difficult to tell when the entire lid has been removed from the can. Also, there is a chance of a mess, if the contents of the can are filled to the brim. One of the first decisions that you will have to make is whether you want an electric can opener that can be placed on the counter or one that can be mounted under your cabinets. Now, for the most part, this comes down to how much space you have on your counter. If you don’t mind yet another appliance cluttering up your surface, then a countertop opener will work just fine for you. Of course, if you decide to go with this design, make sure to consider the height of the can opener. There should be enough space under the blade to accommodate a wide variety of can sizes. However, if you feel that you want to free up some space, then you should go for an under-the-cabinet model. In addition to being a space-saving appliance, these openers also have the advantage of being able to open up cans of all heights. Since it is quite a distance away from the counter, you can use this can opener to open really tall containers. Nonetheless, there is no denying that this can be a rather difficult appliance to install. It requires various tools, a certain number of skills, and also the perfect cabinet from which to hang the can opener. As you can imagine, the blade plays a rather important role in a can opener. This is why it is best for you to choose one that is constructed from stainless steel. Blades made from this material are corrosion resistant, durable, and can withstand high temperatures. All of this means that the blade will be able to cut more easily through cans and will also be able to last a lot longer as well. As with the blades, the housing of these electric can openers can be made from various materials. These include chrome, metals, and plastic. If you want a heavy-duty can opener that is capable of lasting you a long time, then you will find a steel or chrome can opener to be best. While these are more costly, they have the added advantage of being able to open heavier cans without tipping over. On the other hand, if you don’t use your electric opener too often and even then generally stick with smaller cans, you can go with a plastic housing. You will just need to be careful how you use it, though. Now, the main reason you will have resorted to an electric can opener is that you want to make your prep work just a little easier. This is why you should shop a can opener that is similarly easy to use. So, what should you look for? Well, to start with, focus on models that have magnetic lid holders and stable bases. This way, you won’t have to worry about keeping the can steady while the opener is working. Also, think about getting a can opener with a blade that can easily latch on to the lid. And, when you are done, you should be able to detach the lid and can with a press of the button as well. Auto Shut-off function: unless you want to keep checking to see if the opener has cut off the lid, you should get a model that stops when the lid has been detached. This also ensures that you don’t end up with metal filings in your food from cutting off too much of the can. Easy maintenance: remember, you will need to clean out certain parts of the can opener. So, they should be easily detachable and made from rust or corrosion-resistant materials so you can maintain it for longer. Storage-friendly: there is a good chance that you will not want to keep your can opener on the counter all the time. With this in mind, consider designs that easily fit into small cabinet spaces. You should also look for retractable cords to make storage even neater. With all these helpful guidelines and tips, you will have no problem finding an electric can opener that works with all kinds of cans, has a smooth cutting action, is durable, and easy to use. 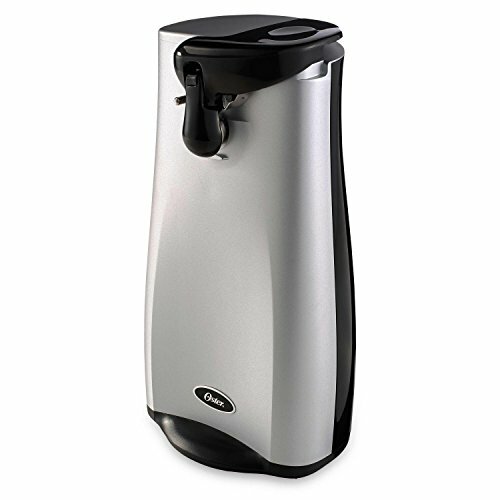 If you want a budget-friendly electric can opener, then you should opt for the Oster can opener. 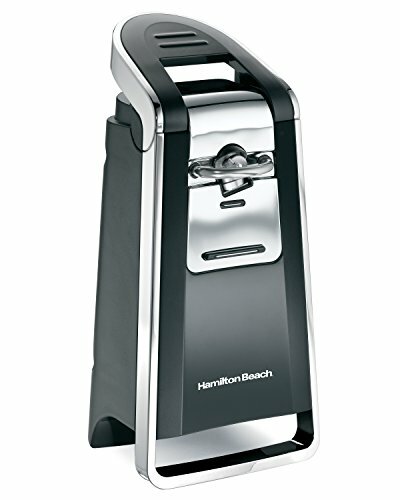 If you are looking for top-notch quality and easy handling, though, you should get the Hamilton Beach opener. 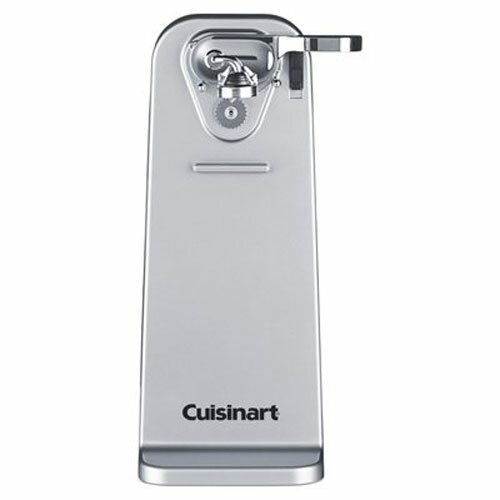 Similarly, the Cuisinart can open is also quite versatile. For a space saver, you will find that the Black+Decker can opener fits the bill perfectly. This model, as well as the Aicok can opener has multiple other functions as well. So, there you have it, all you need to know about finding the best electric can opener for you.